Walking around the city around the end of October (close to Halloween), you might see some little chocolaty long and narrow cakes in bakery windows. And you just might ask yourself what this dessert is all about, after just maybe giving in to temptation by buying a few to snack on. 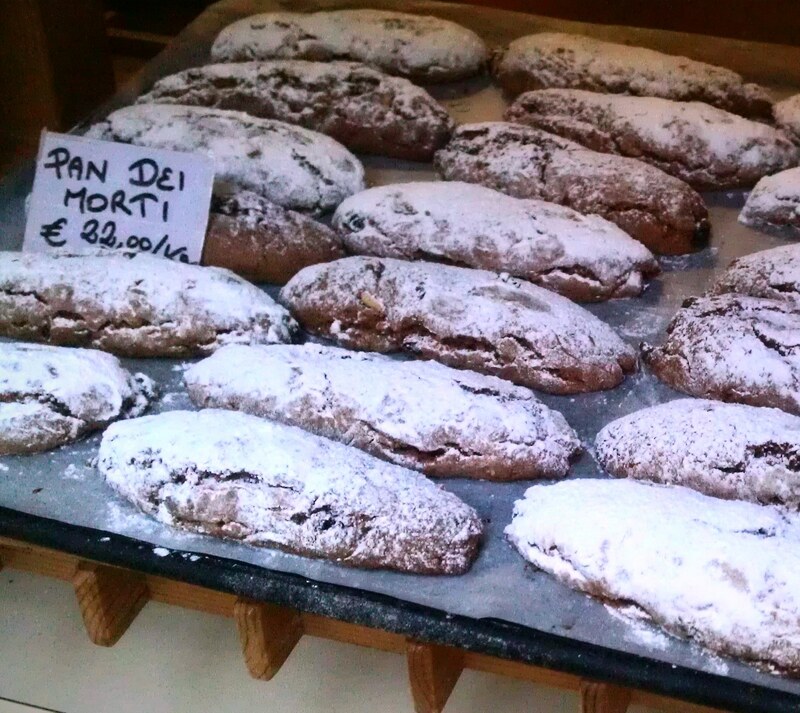 So here’s a little background about the delicious Milanese treat, pan dei morti. Like many of the culinary traditions in Italy, these desserts are made and eaten for a holiday connected to the Roman Catholic calendar. All Soul’s Day (also known as the Day of the Dead and il Giorno dei morti in Italian) is celebrated each year on 2 November. Eating and making pan dei morti is connected to the traditions of the holiday, which is celebrated to commemorate the spirits of the dead as they enter heaven. One of the practices of celebrating is to use the day off from work or school (which is actually All Saint’s Day on 1 November) to go to the cemetery and leave flowers on the graves of family members. In addition, there are traditional sweets all over Italy (either homemade or found in local pasticcerie) that were traditionally left out on the night of 1 November as an offering to the dead or as a symbol of the gifts the souls bring to the living. A lot of these traditions (including the ingredients used in today’s sweets) date back to before the arrival of Christianity, and may be based in Judaism, Roman, Greek and other peoples of the area. The desserts vary from region to region and include fave da morto, ossa di morto, dita di apostolo and pupi di zucchero. A lot of the times they’re in the shape of bones or fingers reminiscent of the spirits they honor. Here in Milano, pan dei morti, made of chocolate, spices, pine nuts, almonds, ground-up cookies and powdered sugar (and sometimes candied oranges, raisins and hazelnuts) has been around in the area for quite some time and today it can even be found in parts of Tuscany. A little-known fact about the Italian tradition this time of year is that in some regions, children used to go door to door, singing or requesting sweets or treats in the name of the dead. Doesn’t that sounds a little like the Anglo-Saxon tradition of Halloween? So why not head to your local pasticceria and try this traditional Milanese dessert? Yum!